LOOK AT THAT HAIRY SPIDER! I DARE YOU TO TOUCH IT! With a lineup of slightly scary, yet super silly critters, Nicole Maubert tempts young tots to try out their tactile derring-do, in a board book with touchy-feely surfaces on every page--slippery sharp shark's teeth, witchy warts, and best of all, a wolf whose toothy jaws pop up from the page. But what's the scariest thing you'll see in this book? Turn to the mirror on the last page and say AAAARRRGGHHH! as loudly as you can... for a big surprise! Maubert's I Dare You! (Twirl Books, 2016 (Am. ed.) uses rhymes and all kinds of surfaces in this board book right on the touch-and-feel target for the approaching scary season. "You've got two minutes to buy a new mouse and get back out here or that hawk will be long gone," Dad warned, his bushy eyebrows pinched together. "Yeah, I got stuff to do before I meet up with Lauren," Lincoln chimed in, flexing his softball-sized muscles. "So make it snappy, butthead!" I whipped open the door of the pet shop. Pete, the short, balding owner, wasn't at the register. 'Yo, Pete! I need help real quick," I yelled. "He went into the back room," a female voice behind me said. My jaw dropped. Standing in front of me was the prettiest girl I'd ever seen in my almost fifteen years on earth. "What are you buying?" she asked. "Oh, just a mouse," I told her. "That's so sweet!" Her face lit up. "Do you mind if I watch while you pick it out?" Mercer doesn't mind. He'd been totally focused on the red-tailed hawk he was going to capture and train to qualify as an apprentice falconer, but suddenly he doesn't want to tell this obviously pet-loving girl the mouse she picks out for him is destined to be raptor bait. Mercer makes the capture with the help of his dad and big brother Lincoln, the bird he jokingly names Flip the Bird that he hopes will make him a full-fledged falconer and give him a chance to please his exacting father. But when he finds that the girl in the pet shop is a new student in his class, he finds his mind divided. Lucy is beautiful, and sweet, and funny, and she seems to prefer him over his well-muscled friend Reed. The Bard said that the course of true love never did run smooth, as Mercer Buddie discovers when he and his family go over the university where his mom works as a cancer researcher and finds Lucy with her extreme animal welfare group H.A.L.T. picketing his Mom's office for using research animals. Lucy seems glad to see him and Mercer chats with her without mentioning what his parents do for a living. And when they meet at school, she invites him to eat lunch with her and her friends. Mercer is happy to forgo meat at lunch to sit beside the lovely Lucy, but he knows he can't tell her the whole truth. And then something happens that makes Mercer see the plot of Romeo and Juliet in a new light. Happily chowing down on a trio of corn dogs with his family at the local fair, Mercer hears something that makes him freeze in mid-gulp. "Frieda, isn't that the woman who's the director of that research lab?" The woman answered,"Oh, Lord, I believe it is, Jerry." Both of them wore red HALT sweatshirts and carried hand-made protest signs. I groaned when I heard Lucy's father say, "How do you live with yourself, lady?" My mom spun and faced her attacker. "Maybe you should find out what clinical research is all about before you spout any more false accusations!" That's when Lucy appeared out of nowhere. "Who are you guys talking to?" She broke out in a huge grin. "Hey, Mercer!" She took two steps toward me when her dad grabbed her shoulder. "Let go!" she said. "That's Mercer. The boy who came to the Wool-Mart protest with me yesterday, remember?" It's the Capulets and the Montagues all over again, and Mercer finds himself right in the middle of the animal ethics wars. Both his parents come down hard on him. He's for protecting animals and admires his dad for working hard to rehabilitate injured raptors, but he's fine with zoos, falconry, and corn dogs, too. For the first time in his life, he finds himself at odds with his parents as well as with Lucy's family. Mercer realizes that he had to find his own way through this dilemma. "Am I not allowed an opinion here?" he asks his father. 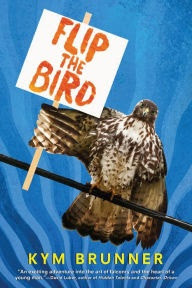 But threading the needle between the ethical values of both sides becomes harder when Mercer's parents are away and the HALT protesters break into and trash the Buddie's rehab center, destroying the medications, and freeing all the birds, including sick ones under treatment and Mercer's hawk Flip the Bird. Even his much loved owl Monocle is found dead, hanged by her trailing jesses, and Mercer and his little sister are left with the job of trying to rescue the missing birds. Kym Bruner's forthcoming new novel, Flip the Bird (Houghton Mifflin Harcourt, 2016), manages to deal with the problems of teen romance and adult ethical choices honestly while allowing for plenty of humor in the ongoing struggle between nice guy Mercer and his realistically drawn, callow lady-killer brother Lincoln. This is a well realized novel, entertaining and absorbing, giving each issue its due, but one that never insults the reader's intelligence with simple solutions for the sake of a too facile happy ending. Solid reading fare for the thinking young adult reader. I came from a world of stories. And sailing on a sea of print our girl sets out, her raft coursing over snatches of stories from the classics--seafaring fare such as The Voyages of Doctor Doolittle, Swiss Family Robinson, and Gulliver' Travels. But she's not steering toward Treasure Island; she is picking up a passenger who needs to feel the fresh breezes of imagination upon his face. The boy is a printed-word denier, but his resistance fades in the face of a flying Peter Pan and Wendy, a drop down the rabbit hole with Alice, and a rum-soaked YO, HO, HO with pirates. He clambers down from crenelated castle walls and dodges dangers with Hansel and Gretel and Red Riding Hood through the darkling forest. 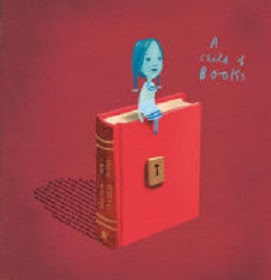 Channeling Emily Dickinson's "There is no frigate like a book," Jeffers' lyrical narration provides a passage to those wild and wonderful worlds between the covers in his latest, A Child of Books (Candlewick Press, 2016). The award-winning, best-selling author (for Stuck, and The Day the Crayons Quit, is well paired with artist Sam Winston, who combines gorgeous realistic colored images with line drawings such as the one in which the two travelers escape from Dracula's castle down a rappelling line made up of vertical words from the tale of Rapuzel. There are lots of similar sight jokes in the illustrations created from print from tales like Frankenstein and Ichabod Crane's Sleepy Hollow, collaged cutouts of actual books which form the background, all set creatively amid Jeffer's hand-lettered text, all of which will give readers some fun in ferreting out their favorites. "… a fresh and fascinating collaboration between two gifted masters," says the New York Time Book Review. "Seriously, though, guys. Try to hold it together without me. Someone will need to keep an eye out the newbies. "Shall I save the pupil for you?" said Alice, slicing the cake. "Absolutely," I grinned and passed out slices of my giant farewell eyeball cake. "I can't help it," I said. "I'm just so... I can't wait for next year, to get back to normal. Be surrounded by normal--" I bit off the stupid thing I was going to say, but it was too late. Alice's face flushed again. Man, I can be such a jerk sometimes. It should have hit me then--being celebrated like a departing rock star. Because here's the joke for you. Where can a cocky, one-eyed ginger be the coolest cat around? Punchline: Only at a school for the blind. And maybe not even there, given the way he's bombed his farewell address to his classmates. With one artificial eye (Artie for short) and partial sight in the other, Richie Ryder Raymond hopes that his talent for the quick quip will see him through his transfer from Addison School for the Blind to a normal, that is, regular eighth grade class at Papuaville Middle, home of the Fighting Guinea Pigs. With a name like that, the comic possibilities seem endless. But it doesn't begin well, as he squints his way through the halls, trying to see the room numbers and maybe spot the gorgeous girl next door. Yep. Room 206! I guess I was being too self-congratulatory to notice the love of my life was standing beside me. I ran right into Jocelyn. She fell backward into the boy behind her. "Hey!" "Watch where you're going!" a guy barked. "I don't think he saw me," said Jocelyn. "Of course, he saw you!" the guy said. He put his arm around her. "No, man, I didn't!" The guy jerked his chin at me. He had brilliant green eyes and the longest eyelashes I'd ever seen on a boy. I blurted out. "Do you have to brush your eyelashes? Because they are mega, mega long!" "You're a freak!" Lash Boy hissed as everyone laughed. "What the heck is wrong with you?" A hand clamped down on my shoulder and Lash boy's. Oh, great. Perfect way to meet my homeroom teacher. "I am ashamed of how you would treat a differently-abled student!" she yelled at Lash Boy. Ryder is outed as "differently abled," and although he tries to explain what happened, his teacher tells Lash Boy (a.k.a., Jocelyn's boyfriend Max) that she's calling his parents. Ryder's hopes of slipping in under the radar are dashed, and now Max, the class golden boy, will have it in for him forever, which is not good, given that Ryder already has a crush on Jocelyn. And that's just the beginning of his problem with being "normal." Living for the year with Gramps while his dad is doing research in Alaska is not easy. Gramps seems stuck in the 1970s, still grieving over the death of his wife at the birth of Ryder's dad. Her weird monument, a stone horse, stands in the middle of the front yard, decorated for all seasons and holidays, and his little house is decorated in stereotypical seventies style. Gramps plays disco constantly in his old Oldsmobile, and talks about Ryder's grandmother as if she's still alive. Ryder's mom must find that a bit creepy, too, because she takes to working unusually long hours to avoid being there whenever she can. But Jocelyn lives next door, and Ryder soon learns that her little brother died in a fire and that she was rescued by Max when they were eight years old. Adding that to the fact that Max is considered a hero, a real Mr. Nice Guy at school, Ryder figures his chances with Jocelyn are dimmer than his vision. And Ryder’s hopes of getting to normal don’t grow any brighter when he and Gramps walk into an argument outside Home Depot, where Max is fund-raising for a project for grief counseling. I punched Max Waters in the face. And then Max gets even by tripping Ryder in the cafeteria. Artie the artificial eye pops out, skitters across the floor, followed by retreating girls screeching and guys kicking it around the room. And for the punchline, at first Ryder finds that he’s got no joke, nothing. Artie comes to rest in front of his homeroom teacher, Miss Singer, who picks it up, her pity radiating from her, and looks around for Ryder. I slammed a big old NOPE sign on the pain stew in my gut. I reached for my eye. I climbed on top of a chair. Cupping Artie in my hand, I rubbed it on the hem of my shirt. I slowly, slowly, slowly popped the eye back into place. Then, arms out, like this was all a huge theatrical joke, I bowed–-three times in fact. 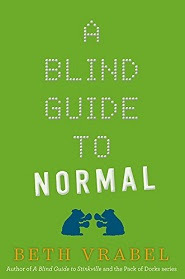 Normal (Sky Pony Press, 2016), Ryder finds that maybe normal is accepting a new normal that includes anger, sadness, and loss. And they’re all okay. With a moving cathartic conclusion, Vrabel fashions a coming-of-age story that middle readers will never forget. Ryder's honest first person voice is funny, yet poignant, one that gets the reader right inside him, seeing the world through his eye. Each character has a way to hide, something inside he or she try to cover up and forget. Jocelyn has her scars hidden under long sleeves, the outward reminders of her guilt for her little brother's death, Max has his own secret of starting that fatal fire, and Ryder's parents have their own fears that his cancer might return. Gramps has his grief for his wife and the signs of her existence he can't bear to remove from his life--all things that make them different, yet make them normal human beings. Says School Library Journal, "A sweet, thoughtful, and funny read--a heartfelt tale without the typical saccharine coating." WHICH ROOM IS MISSING FROM A GHOST'S HOUSE? WHAT'S A ZOMBIE'S FAVORITE PAINTING? EUROPE TO NO GOOD ON HALLOWEEN, AREN'T YOU? It was a quiet cave and that's the way he liked it. Visible only as a pair of vigilant and somewhat scary eyes, Theodore keeps an early morning watch at the mouth of the cave. Is he waiting for breakfast? A plump but unsuspecting bird flies down and lights in full view. Theodore thought, "Does it want me to eat it?" "Go away, silly bird. I won't eat you." The sun climbs higher and Theo watches as a wolf catches his breath in front of the cave and howls. But Theodore isn't hungry and decides not to eat the wolf. He continues to watch. A tiger bounds into the grass in front of the cave and stretches with a growl. Theodore mulls the choice over, but still he isn't really hungry. "I will not eat you," he says. And then, as the shadows grow long, a different figure appears in Theodore's view. It's a strange figure, a small boy in a hoodie, with a trash can lid for a shield, who gallops up on an invisible steed, brandishes a toy sword, and roars a loud ROOAAARRR! "Don't bother me, pesky boy," Theodore bellowed, "or I WILL EAT YOU!" Theodore pokes his long toothy snout out of the cave, but the pesky boy just pokes him in the nostril with his little sword. Theodore emerges, a fairly scary red dragon with scales, claws, and wings. 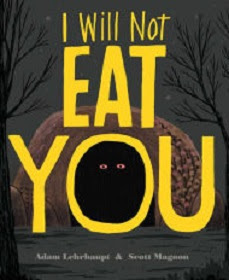 But looking down at the brave little knight-in-training, Theodore finds that he's lost his appetite for eating visitors, and instead heads off to the meadow with the pesky boy, who decorates his new dragon friend with daisy chains, in Adam Lehrhaupt's I Will Not Eat You (Simon and Schuster, 2016). Popular artist Scott Magoon, the illustrator of Michael Rex's hilarious Halloween spoof, Goodnight Goon: a Petrifying Parody lends his artistic talents to this portrayal of a matter-of-fact but picky monster who turns out to have a soft spot for picking posies with a small boy. A not-so-scary monster in the dark cave story that will provide giggles of relief for Lehrhaupt's doughty little hero. Says Kirkus Reviews, "The palette, though dark, is never menacing. Fanciful pretend play for the dragon-slaying preschooler." Hello! We have no time to play. We are making cozy dens and nests. A girl in a bright scarf sets out from her doorstep. She walks through the woods, along a creek. The breeze is light and warm, but everything she sees--the trees, butterflies and foxes, blue jays--seem to be getting ready for something to happen. Even the few bright flowers know something is changing. We are leaning into the sun, enjoying the last summer rays. Some of us are late bloomers. We make the end of the summer more colorful. As the girl moves out of the woods and into the town, she sees the storekeepers rolling up awnings, and passersby hurrying along as she hears a distant rumble of thunder. She greets the sudden whipping of the wind, and the wind answers, too. Hello! I love to whoosh drizzle and leaves through the misty streets. Back toward home the girl goes, noticing that the trees are indeed changing colors, the air is growing chill, and the persimmon-colored sun is setting earlier than before. 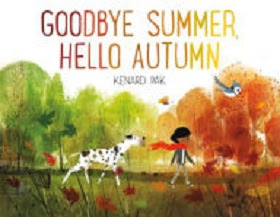 The season is changing before her eyes as she heads back homeward for a sweater, and it is truly time to say hello to autumn, in Kenard Pak's Goodbye Summer, Hello Autumn (Henry Holt and Company, 2016). With his keen observations of the changing seasons and beautifully executed expressionistic watercolor illustrations, Pak uses the theme of the nature walk, seeking signs of fall, from insects to mammals, sunshine to chilly rain, and golden afternoon to early nightfall. This is a fine book for early childhood classes studying the cycle of the seasons, especially those planning to head out soon for their own "signs of fall" walk. Says School Library Journal, "A gentle, gorgeous welcome to summer's end and fall's beginning, perfect for storytime or one-on-one reading." BOO! You might not recognize me, because I'm wearing a costume... but I'm still a fairy princess underneath. You can take the princess out of her sparkles, but you can't take the sparkles out of a princess. "That's not a costume! That's what I AM!" How to find a costume that allows her to keep her crown and wings? 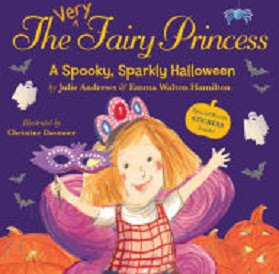 But real fairy princesses rise above adversity, and Gerry has a stroke of brilliance. She adds a draped white sheet and a halo, and voila'--she's an angel! At school everyone is dressed for the occasion, and her best friend Delilah shows her her dentist's costume, pointing out that that is what she's going to be when she grows up. But at lunch, class clown Connor gets a bit wild with the ketchup for his hot dog and squirts the red stuff all over Delilah's impeccable white medical coat. Delilah is distraught. "I can't wear this in the parade! It sends TOTALLY the wrong message about dentists!" But a friend in need is a friend indeed. Gerry takes off her sheet, and tying it around Delilah's shoulders in two big knots, turns her into a giant tooth. "But what about your costume?" asks the loyal Delilah. Gerry gets to work with construction paper, glue, and glitter, and presto! Suddenly she's the Tooth Fairy, the perfect parade partner for Delilah, and the two take the trophy for the Most Creative Teamwork. For aspiring young wizards, the last quarter of the year offers two theaters of action to show off their skills--Halloween magic shows and upcoming science fairs. And this two-for-one handbook of potions and spellbinding physical phenomena offers would-be Harrys and Hermiones step-by-step directions for mastering potions and spells without the nefarious supervision of Severus Snape or Horace Slughorn. 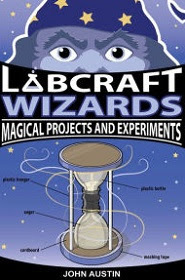 John Austin's Labcraft Wizards: Magical Projects and Experiments (Chicago Review Press, 2016) is a manual of magico-science which begins at the beginning with crafty instructions for the making of the necessary magical accouterments--wands, hourglasses, and a whiz-bang atmospheric enhancer, the dazzling Smoke Ring Launcher which also demonstrates the principal of the toroidel vortex. From there author Austin moves on props such as Ogre Snot, a colloidal gelatin-in-a-jar magical cure-all (labels provided in the appendix), Glycerin Smoke, wispy and evocative for spell-casting, and the ever-popular Cloud in a Jar, which opens to a miniature storm. It's helpful for the young spellmeister to have a few other easily concocted props around. Some projects, like the Dragon Egg, require only a raw egg in the shell, vinegar, and perhaps a drop or two of food coloring, depending upon the color of your dragon, a simple project which demonstrates the action of acid upon calcium and the principal of osmosis and also produces an egg that will bounce. Others, such as Hot Ice, the Two-Liter Tornado, and Frozen Snowstorm, require some time and skill to carry off and demonstrate more advanced scientific principles. All experiments/tricks make use of inexpensive common household substances. A few require having on hand substances like the spice shelf staple cream of tartar, the presence of which depends on whether Mom makes meringue often, or an aerosol hair or freshener spray. Meticulous attention is paid to making homemade apparatus from household objects like coat hangers, ballpoint pens and pencils, masking tape, jars and plastic bottles, with appropriate safety warnings for using heat or sharp tools. When Halloween is over, when Christmas trees come down, and school holidays end, there comes the sometimes-dreaded Science Project Season and the subsequent scramble for helpful handbooks for those assignments which profit from step-by-step, illustrated instructions, and Labcraft Wizards: Magical Projects and Experiments, provides plenty of intriguing projects with a clever hook--wizardly science. Says School Library Journal, "Use this spellbinding selection to introduce students to science through play and for book club activities with a magical or fantasy theme." POINTED HAT AT THE WINDOW. CAN YOU GUESS WHO... FROM THIS HAIKU? Ho-Hum Halloween? Same old humdrum happenings? Uninspired by the usual suspects in your scary season tales? Not in this clever new way to say BOO! Just see what a haiku or two can do for that hoary old holiday! 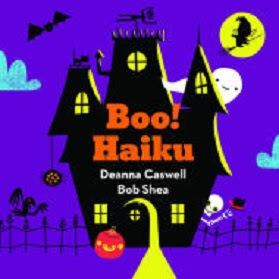 With Halloween poetry boasting little more than variations on "Five Little Pumpkins," poet Deanna Caswell and popular illustrator Bob Shea combine their talents in this never-seen-for-Halloween collection of haiku poems, Boo! Haiku (Abrams Appleseed, 2016). Never fear, all of the usual crew of characters has their own haiku--your cackling witch, black bat, grinning Jack, and the rest, but in a haiku, it's way to say BOO that feels really new. Woohoo! Kids will easily guess WHO each haiku describes: Eight legs in a web? Check! A straw man standing guard? Check! SCOOP FOR PIE AND ROAST ITS SEEDS. 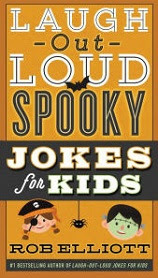 The haiku form lends itself well to these poetic riddles, and youngsters will joyfully recognize their old Halloween friends out for some fun, especially when the real stars of the show knock on each door, seeking treats. Artist Bob Shea is the master of the simple, iconic comic illustration style, setting vivid shapes against sharp contrasting backgrounds. Each right-hand page poses the haiku question, requiring a suspenseful turn of the page for the treat of the right answer, and the visual fun continues right down to his jolly repeat pattern of jack-o' lanterns, candy corn, and little ghosts on the book's endpapers. Rollicking poetic riddles, evocative descriptions of scary characters, all set against Shea's vigorous and effervescent illustrations, give the old theme a brand-new look. Happy Haiku Halloween To You! Day is done, and Max the little black kitten is going through his necessary nighttime ritual. He says goodnight to his fish, and to the spider, and to his favorite box, and then he comes to his final goodnight. BUT THE MOON IS NOWHERE TO BE SEEN. Max is sleepy, but he is also brave and determined. He goes outside, under the dark blue, starlit sky and calls to the moon. Still Moon is nowhere in sight. How can Max say goodnight? "MAYBE I'LL SEE MOON IF I GET A LITTLE HIGHER," THINKS MAX. Max hops up on the snoozing dog's back. No Moon. He climbs a tall tree, and from there clambers up on the rooftops, but he still sees no sign of his Moon. He goes up to the roof of the tallest building he can see, but he sees no Moon from there. Weary, Max scales the highest hill. A chill wind whips around him. The sky is cloudy and dark. Max can't see the stars anymore. Where is Moon? And then the wind parts the clouds, and there is MOON! Max at last gets to tell him goodnight! Then Moon whispers a secret. "DID YOU KNOW THAT I CAN HEAR YOU SAY GOODNIGHT FROM HOME?" "NOW YOU TELL ME!" SAYS MAX. 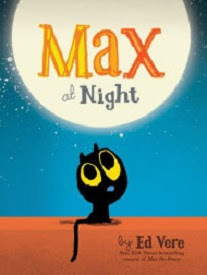 In the companion book to his 2015 hit, Max the Brave, Ed Vere's Max at Night (Sourcebooks Jabberwocky, 2016) takes the sometimes intrepid Max into a new nighttime adventure. A tiny, big-eyed black kitten, Max is an unlikely hero, but he bravely does battle with the dark and finally finds the light, a benevolent Moon who whispers the comforting message that he is always there, even when he's not in sight, the very message that parents also seek to impart at bedtime. Youngsters will enjoy knowing what Max finds out, that the moon is a constant of the night, and Ed Vere's illustrations make Max the center of each page as he moves left to right across the succeeding pages and the background shifts from the cozy pastels of Max's room to an ever-darkening and ascending landscape, one that parallels his theme. This story happily ends, as all good bedtime stories should, with little Max fast asleep. "Cozy, dozy, comforting fare," says Kirkus. 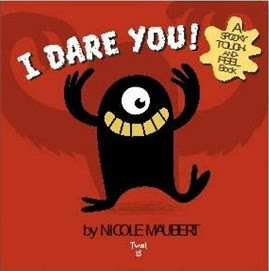 With a lineup of slightly scary, yet super silly critters, Nicole Maubert tempts young tots to try out their tactile derring-do in a board book with touchy-feely surfaces on every page--slippery sharp shark's teeth, witchy warts, and best of all, a wolf whose toothy jaws pop up from the page. But what's the scariest thing you'll see in this book? Turn to the mirror on the last page and say AAAARRRGGHHH! as loudly as you can... for a big surprise! Two desert tortoises come upon a lost hat. Each tries it on. The hat is a tall, impeccably white, ten-gallon, Hopalong Cassidy-type hat, tempting, but totally unsuitable for tortoises. But the two think otherwise. They each try it on, and the other generously pronounces that it looks good on his friend, despite the obvious fact that the hat covers their heads, necks, and shoulders (to the extent that tortoises have shoulders). But it is clear that each covets the hat, and they rationally agree that the fair thing to do is to leave the hat where it lies. They mosey off toward their sunning rock, but their ovoid eyes, with backward looks, betray that each wants that hat! Night begins to fall, the two tortoises amble past a couple of saguaro cacti, and clamber up a knoll to their warm rock as the sun sets behind them. WE ARE GOING TO SLEEP HERE... TOGETHER. One tortoise's eyelids grow heavy at half-mast, but the other's eyes shift back toward the hat, his intentions clear. He wants that hat. He waits for the other to fall sleep. His partner mumbles that he is, and the first tortoise sits tight, his wide-awake eyes sliding back toward that hat. ARE YOU ALL THE WAY ASLEEP? His partner murmurs convincingly that he is and that he is in the middle of a dream. The first tortoise begins to sneak toward the hat. This is his chance! Now, if his friend just stays asleep, the hat will soon be his. Then he hears his friend's voice. I AM DREAMING THAT I HAVE A HAT. The tempted tortoise stands over the hat with a sly look that seems to say, "In your dreams, buddy!" YOU ALSO HAVE A HAT. 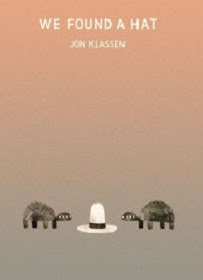 That changes everything, in Jon Klassen's just published closer in his Hat Trilogy, We Found a Hat (Candlewick Press, 2016). How can the potential perp take the hat in the face of his friend's generosity? He can't, of course, and soon the two are dreaming together, both wearing a white hat. In this last tale in the trilogy, justice is again done, but this time in fairness and friendship rewon. Author Klassen sticks to his wry, straight-faced dialogue, each word well-weighed and telling. His illustrations are equally spare, but this time he uses a different, desert-toned palette, and his choice of a white hat instead of a black hat hints at his theme that the good guy is gonna win in this one--winning not in swiftly executed "justice," but in mutual affection. The final spread shows the two tortoises sound asleep and dreaming of a world in which both wear white hats under a starry desert sky. The stars have also come out in fittingly starred reviews for this sly and yet sweet finale to Klassen's trilogy. "A different but wholly delightful and thought-provoking capper to Klassen’s ingenious series, says School Library Journal. For aspiring young wizards, the last quarter of the year offers two theaters of action to show off their skills--Halloween magic shows and upcoming science fairs--and this handbook of potions and spellbinding physical phenomena offers would-be Harrys and Hermiones step-by-step directions for mastering potions and spells without the nefarious supervision of Severus Snape or Horace Slughorn. John Austin's Labcraft Wizards: Magical Projects and Experiments (Chicago Review Press, 2016) is a manual of magico-science illusions which begins at the beginning with instructions for the making of the necessary magical accouterments--wands, hourglasses, and a whiz-bang atmospheric enhancer, the dazzling Smoke Ring Launcher which also demonstrates the principal of the toroidel vortex. From there author Austin moves on props such as Ogre Snot, a colloidal gelatin-in-a-jar magical cure-all (labels provided in the appendix), Glycerin Smoke, wispy and evocative for spell-casting, and the ever-popular Cloud in a Jar, which opens to a miniature storm. It's helpful for the young spellmeister to have a few other easily concocted props around. Some projects, like the Dragon Egg, require only a raw egg, vinegar, and perhaps a drop or two of food coloring, depending upon the color of the dragon in mind, a simple project which demonstrates the action of acid upon calcium and the principal of osmosis and also produces an egg that will bounce. Others, such as Hot Ice, the Two-Liter Tornado, and Frozen Snowstorm, require some time and skill to carry off and demonstrate more advanced scientific principles. YOUR SKIN MUST BE GREEN, THE WART ON YOUR NOSE. Seated on brooms, they zoom, in towering, pointed hats. Got that? But there one another creature who is green, but he's got no black hat. One fat imp has a wart, but he's not green. Witches stir up a brew with eye of newt, and their favorite friend is the ever popular black cat. But that's not a witch with that cauldron. And isn't that a vampire with that cat? There's the Bride of Frankie Stein, and there are ghosts and ghoulies, spiders and wizards, and. . . isn't that a warlock, too? It's hard to tell the spooky creatures without a program, but one thing is for sure. They ALL want treats! 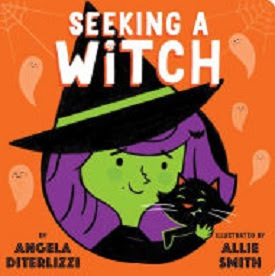 Veteran author Angela DiTerlizzi's new board book, Seeking a Witch (Little Simon, 2016), introduces little ones to the characters of Halloween who may soon be at their door, the usual suspects of every Halloween party. Nobody is a bit spooky in Allie Smith's illustrations for this little book which introduces tots to the fun of the scary season. Ruthie has a problem in school. It's not the students. It's not the classroom. It's not the reading, or the writing, or the arithmetic! The Snurtch is lots of things. Nice is NOT one of them. He's scribbly and scrunchy, grabby and burpy, and rude. Ever since Maurice Sendak showed us where the wild things are, that is, right inside ourselves, we've known that our worst selves sometimes get the best of our best selves, and that's what happens to Ruthie at school. The Snurtch is the shaggy, scribble of an orange-crayoned monster that won't let Ruthie sit down at her desk. He's the inner meany who makes her throw her pencil, and the crude critter than creates the rude noises and crumples up George's drawing when he tries to share. The Snurtch rides on her shoulders, even when she is sent to do timeout in the corner. Ten minutes later, Ruthie tries to draw something pretty, or cute, or happy, but all that comes out of that crayon is unhappy scribbles. How do you get a Snurtch off your back? How can Ruthie put her Snurtch in his place? Luckily for Ruthie, when she apologizes and shares her drawing of the Snurtch, all the kids in her class recognize him immediately. "It's what throws our pencils! It's what makes weird noises! It's what drew on my drawing!" they all say. Ruthie realizes that she's not alone. 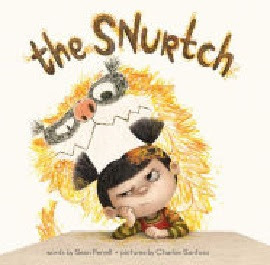 Suddenly, Ruthie sees all the kids have their own scruffy, selfish Snurtches too, in Sean Ferrell's The Snurtch (Atheneum Books, 2016). How to manage the devil who makes you do it, to master that selfish old id inside, is part of growing up, and Ruthie is on her way in this reassuring story of self-understanding and impulse management. Artist Charles Santoso draws Ruthie just right, as a beetle-browed little girl whose very braids are too tight and a little out of control, her scowl betraying the battle within. Kirkus Reviews gives this one a starred review and recommends that a copy of this book should sit on every book shelf--"the high one, just above a Snurtch's reach," and Booklist says, "kids will identify with having a fidgety, mischievous monster inside." The first acorn of autumn falls. The squirrels rejoice and go into their fall feeding and harvest frenzy. Color begin to bloom here and there among the green leaves. Crates of new-picked apples and late vegetables reveal the plentiful harvest. And then comes Frightfall, with kids disguised as black cats and ghosts and grinning jack-o' lanterns, carrying plastic cauldrons filled with colored candies. But not all of us are as joyful as the squirrels and sweets-loving kids. The end of summer brings cooling breezes and its own colors, but also a sort of nostalgia for the promise of spring and the fullness of summer we now know is past. With a lyric sense of the longing and beauty that autumn brings, Hall's new book bring simple spare verse, arranged vertically like his iconic tree, that itself becomes the setting for each stage of the passage through the season, from the first acorn's fall to the snowfall that brings out the sleds. Living mostly in the present, children still have a sense of nostalgia about the passage of time, symbolized here by the tree, in which the only constants are its squirrels. But the tree has its own voice, as it goes into its pro tem dormancy: I'm resting now but I'll be back. The author's wordplay with the sound of the prefix "ful" and "fall" adds whimsical but poignant meaning as it comes down at last to a snowful scene of the first snowfall of winter. Artist Hall digitalizes his acrylic-painted cut paper illustrations, moving in double-page spreads as time makes its linear progress with every page turn through the season. Bold colors and geometric shapes give this book a look that will appeal to the youngest, but older primary readers will feel the undercurrent of emotion that the changing of the seasons, the relentless passage of time, brings. 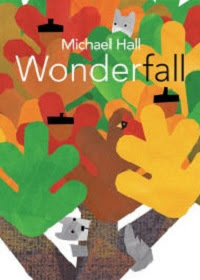 Among the seasonal concept books of the year, Wonderfall is the one book to choose, a must-have purchase for public and school libraries. "A haunting journey through autumn and a lovely triumph," writes Kirkus in their starred review. Henri Matisse was near the end of his career, and his hands were less able to paint fine details, he found that he had not lost his desire to make art, and he turned to a new medium, that of cut-paper collage. 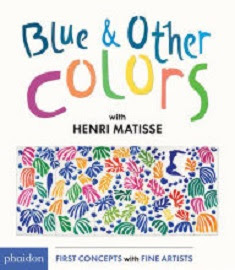 His sense of color and line and texture were still that of a master, and that period of his work is the stuff of Phaidon Books, new book for the youngest children, Blue and Other Colors: with Henri Matisse (First Concepts With Fine Artists) (Phaidon, 2016). In this beautiful little board book, Matisse plays with ground, foreground and background, as colors reverse position, and plays withs hape in a way that is intrinsically appealing to the very young, honing their fresh, young eyes and perception with his compositions of color set against bright white backgrounds. Beginning and ending with blue, but including all the primary and secondary colors as well, this concept book is a brilliant introduction to the use of color in design, color recognition, and the art of composition. The New York Times Review of Books says, "his lovely, well-conceived example seems liable to leave a lasting impression on a little mind,"
All the drama had come to an end. George and Harold searched their tree house for clues... but soon got distracted. "It's a box full of old Dog Man comics we made when we were kids," said George. "Hey, I forgot all about these!" said Harold. They read for hours. "I crack me up," said Harold. "Look how you used to draw!" said George. "Old school!" said Harold. "And look how bad you used to SPELL!" "Let's make a new comic book," said George. Yep! The comic hero hiatus is over, kiddos! Dav Pilkey is back. George and Harold are, oh, so, mature fourth graders, and vowing to outdo their primary-grade best sellers, they have a brand-new comic supa hero, Dog Man, with supa dupa better spelling, even. DOG Man was reborn anew-ish! A Hero is unleashed! The product of a head transplant from Greg the Police Dog (who was smarter) to Officer Knight's body, Pilkey's new hero sets out to avenge the cruel cause of their emergency amalgamation against Petey, the mad cat scientist and supa scofflaw. Petey is not happy with his new trans-species nemesis. "RATS!! I unwittingly created the greatest cop of EVER!!!!!!" It's back to the lab for Petey, who creates a monster, a giant version of the thing all dogs fear most--a self-powered robo Vacuum Cleaner! "Let's get ready to Roomba!" chortles Petey. Dog Man triumphs over Vac Man, and Petey is imprisoned. But not to be foiled, master villain Petey mail-orders a can of Invisible Spray and escapes unseen and unsee-able. Invisible, Petey is free to carry out his detestable anti-canine crime wave at will. But detective Dog Man has his secret sleuthing equipment already on board--his supa sniffer nose. 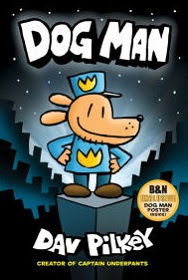 If Petey can't be seen, he can be scented, and Petey's days on the lam are numbered when a supa police dog-man hybrid is hot on the trail, in Dav Pilkey's newest best seller, Dog Man: From the creator of Captain Underpants (Dog Man 1) (Scholastic Press, 2016). Packed with supa silly stories, some petty potty humor, and all the chuckles that provided by The Adventures of Captain Underpants, former fans and new readers, reluctant or otherwise, will welcome this new series of lighthearted graphic novels. All dressed up with George's new and improved spelling, full color panels, the ever-popular flip pages, and a poster, plus all the usual suspects from George and Harold's zany world, this one has the humor for which Pilkey, also the author of a plenty of hilarious picture books such as Dog Breath, Kat Kong, and The Hallo-wiener, is famous. A rapid release is also planned for the second book, Dog Man Unleashed (Dog Man 2): From the creator of Captain Underpants in December. Readers and reviewers alike acclaim this one: as Booklist says with a starred review, " "Pilkey... has again fired an arrow of joy straight at the fevered childhood psyche of millions of readers. An utter, unfettered delight."